VXX and VXZ Now Five Years Old! In the midst of all the emerging markets turmoil, I wanted to take a moment to acknowledge the fifth birthday of the two pioneering VIX ETPs : VXX and VXZ. Launched five weeks before stocks hit their 2008-09 financial crisis bottom, both VXX and VXZ have struggled against a tide of falling volatility over the course of the past five years and have also been battered by persistent contango in the VIX futures, which has created additional head winds in the form of negative roll yield. Note that even though each of the five years have been losing years for both products, there have been periods in which these products have been extremely strong performers. One of these periods was from July to October 2011 when VXX nearly tripled (maximum gain of 198%) and VXZ rallied some 66%. I mention this because both have performed well in January, with VXX up 13.0% as I type this and VXZ with gains of 2.2% for the year. While I am not going out on a limb and predicting a renaissance for these two VIX ETPs, they are two of the most important and liquid VIX ETPs on the market and can be attractive hedges or speculative trades when the markets go through a period of selling and/or there are concerns about a potential crisis. I have been writing about these even before they were launched and will continue to offer my thoughts on them going forward. 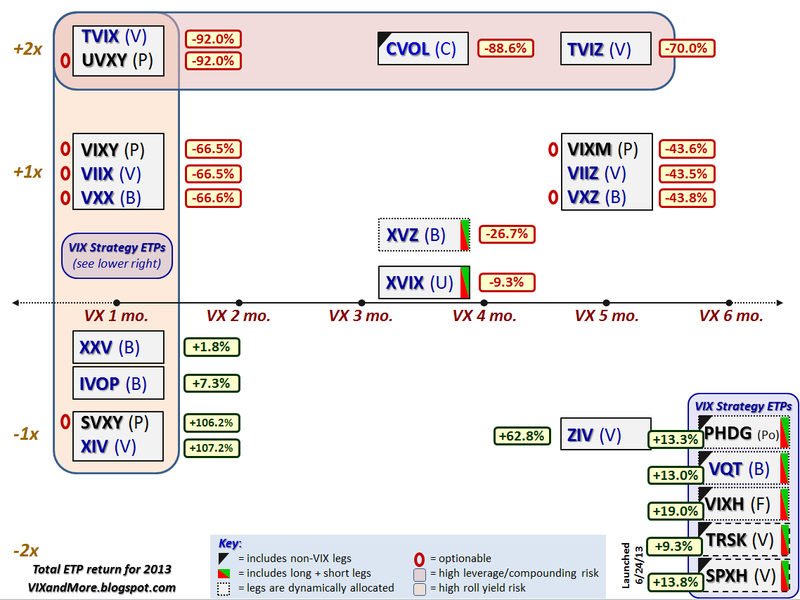 A number of readers have asked me to recap the performance of the VIX ETPs in 2013 according to the leverage/maturity grid I have been publishing for several years. The graphic below should look familiar to long-term readers and measures the performance of all VIX and volatility ETPs for 2013, including dividends. (Two exceptions are TRSK and SPXH, which have data going back to June 24, 2013 and as such, the closing price on that date is treated as the opening price for 2013.) This time around I am going to refrain from most editorial comments, yet point out that the data bears a very strong resemblance to what I presented in VIX ETP Performance in 2012. It is also worth noting that just because there were similar numbers in 2012 and 2013, one should not expect these patterns to repeat on a regular basis. In Performance of VIX ETPs During the Recent Debt Ceiling Crisis, for instance, I present a very different set of data that students of volatility should also pay close attention to. 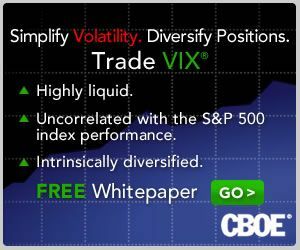 For a more detailed discussion of the performance drivers of various VIX ETPs and for additional performance data and commentary, the links below should provide an excellent jumping off point. This is the sixth year in a row I have offered a retrospective look at the year in VIX and Volatility, which is my attempt to cram the highlights of the year in volatility onto one graphic with a manageable amount of annotations. In terms of equity volatility and specifically the VIX, 2013 was the story of a persistent bull market in stocks and very little in the way of implied or realized volatility, at least by historical standards. In fact, the VIX’s high water mark of 21.91 was the second lowest annual high point since 1995, eclipsed only by the Greenspan liquidity flood in 2005. Similarly, the average VIX in 2013 was just 14.23, considerably lower than the long-term average, which is a shade over 20. The year only saw two days in which the SPX was up 2% or more and another two days in which the SPX was down at least 2%, the fewest number of such days since 2006. Even though the numbers may not be impressive, there were still some significant events during the course of the year that were able to provoke substantial anxiety and fear, at least for the short-term. The year began with the Fiscal Cliff drama coming to an end and saw fear in the euro zone heat up after the Italian elections ended with a parliamentary deadlock and Cypriot banks triggered a joint EU/IMF bailout of Cyprus. The Boston Marathon bombings provided a jolt of terrorist fear in April and fears about Japan the future of Abenomics created huge volatility in the yen, with ripple effects felt across currency markets and in many related financial markets during May and June. In the U.S., the Fed tapering scenarios dominated the investment landscape during the second half of the year and the debt ceiling crisis, government shutdown and entrenched bipartisan bickering cast many doubts about the potential for some huge self-inflicted wounds. In the end, the SPX set 44 new all-time closing highs in 2013 and the VIX ended the year almost 24% below where it finished in 2012, though the Fiscal Cliff was responsible for most of that gap. So far 2014 looks more interesting from a volatility perspective, but the year is young and the volatility story is always one of surprises in the form of swans with dark gray plumage. Every year I tabulate the most-read posts in this space as a way to monitor the issues that are resonating with readers and also to see how these issues evolve over time. These most-read posts also serve as easily accessible repositories of high-quality material for the benefit of new readers and long-term readers alike. 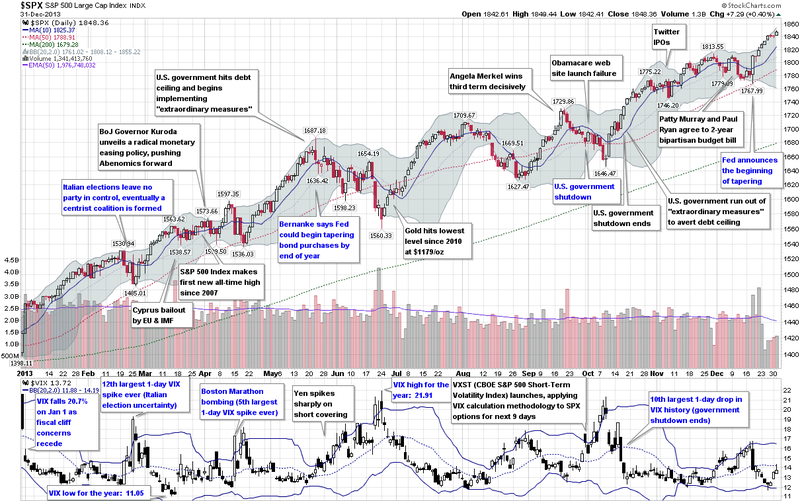 The top themes from 2013 echo some top themes that resonated with readers from previous years, including continued interest in VIX spikes and SPX pullbacks, as well as the VIX ETPs, low volatility ETPs, the Fed, interest rates and various global flash points, such as emerging markets. The posts below represent those that have been read by the highest number of unique readers during 2013. Farther down there are links to similar lists going back to 2008, along with several other “best of” type posts that I have flagged for archival purposes. So…was the VIX too low in 2013? In order to answer this question, I am updating a chart I last presented in October 2012 in Ratio of VIX to Realized Volatility Higher than Any Year Since 1996. As the chart shows, both the (mean) VIX and 10-day historical volatility (HV) of the S&P 500 index were are relatively low levels during 2013. More importantly, the VIX maintained an average premium of 34% to the 10-day HV of the SPX during the year, which is right in line with historical norms going back to 1990 of a premium of about 35%. While I have used data provided by the CBOE going back to 1990 in calculating historical norms, I think it is worth noting that from 1990-1996, the VIX typically had a much higher premium relative to historical volatility in the SPX than it has in more recent years, so whereas the long-term VIX premium to HV stands at about 35%, the post-1996 average premium is closer to 26%. As a result, if you really need to drive home the point that the VIX was “too low” in 2013, you can always trot out the post-1996 data, but otherwise consider the VIX to be just about exactly where it should have been – at least in relation to historical volatility – during the past year. Last but not least, the chart also illustrates that while the VIX and SPX HV do have a tendency to trend over the course of several years, the ratio of the two has a much more random movement and is therefore much more difficult to predict for 2014. Chart of the Week: No More Free Lunch for Volatility Sellers?